Using simulated blood, students can observe the antigenantibody reactions for the ABO blood groups. Known types of blood are tested with antibodies to illustrate the agglutination pattern. Then, unknown blood types of four hypothetical people are tested and their blood types determined. Students observe normal and abnormal human karyotypes then identify chromosome abnormalities in Down’s Syndrome, Klinefelter’s and Turner’s Syndrome karyotypes. Students are introduced to pedigree charts to trace characteristics through three generations. 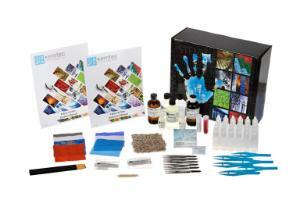 Kit includes: simulated A, B, AB and O blood; four marked simulated blood anti-A and anti-B serum, toothpicks and PTC paper. Grades 7-10.